Every August - far from the big city, but close to the human spirit, detached from our endless daily race, and connected to our need for time and peace of mind, deep in the south of Israel - in the desert – a remarkable, one of a kind enterprise comes to life. It is the "Tel-Hai International Piano Master Classes", which take place in Sde Boker – about two and a half hours south of Tel-Aviv. Classical music in the desert? Can Mozart and the "Wilderness of Zin" find a common language? Will Beethoven find his way through the spring of "Ein Avdat"? In this surreal location the real becomes unreal, and the unreal becomes a dream, where our eternal music caresses the landscape in a way I have never experienced before, or maybe it is the other way around. For nearly three weeks, some seventy pianists from about two dozen countries come together in search of answers, of discovery, in a most unusual place. For all of us – staff, students and spectators – this becomes an experience of everlasting increase of awareness, one that is drawn from several unexpected inspirational resources. From the first day, private lessons, public master classes and concerts are being held. On top of that a competition of a newly commissioned Israeli work takes place as well as a concerto competition, in which three young pianists are chosen to play as soloists with the Israeli Symphony Orchestra Rishon LeZion. One of the primary goals of this unique project is that the center of gravity will be the students and their experience, which they are able to shape according to their own needs, with us – the professors – giving advice. As the master classes begin to take shape, people get acquainted with themselves and with the land. Then, miracles start happening: I saw Mozart the other day, playing tricks with some girls at the bottom of "Zin" wadi. He can be so "uncivilized" at times... also in his music! A few other students went after midnight to watch the stars. Instead, they saw Chopin dancing privately with George Sand. She wanted to dance to a Polonaise, while he preferred a Mazurka. Usually he looks so frail. Here, in Sde Boker, I swear he was feeling much stronger. After the first few days a sense of familiarity takes place, and adventures are attempted. 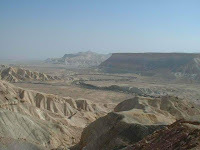 We all travel together about thirty minutes south to "Machtesh Ramon", the largest natural crater in the world. On the way we make a brief stop to admire the unfolding view. In the far distance we can almost see Haydn working on his new "Creation". Here, in Sde Boker he is regaining some of his lost fame, with countless of fine performances of his sonatas. 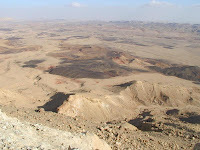 In "Machtesh Ramon" we go for a hike. A quick glance into the impressive horizon lying in front of us sends our imagination soaring. These are sights coming straight out of the book of Genesis. Looking at the walls of this enormous natural structure reveals millions of years of history. Can our music, which is mostly from the last three hundred years, somehow relate to that? Oops… suddenly Ginastera jumps out of the cliff, with his Argentinean dances. They almost sound as chaotic as Haim Permont's Moment Musical – the commissioned work for this year's classes. Beethoven decides to join us along for our walk. I think he hears better here, although he still complains. His late sonata – no. 30 in E major Op. 109 – is performed three times during the course of this festival. Is this a coincidence, or does late Beethoven fit our atonal landscape better than anywhere else? We head back just in time to have some cheese and wine, and hear Liszt trying to impress Clara Schumann with his flamboyant playing of a new "Israeli Rhapsody". I believe he is thinking of a new Annees de Perelinage ("years of wondering") – after Swiss and Italy, now… Israel!! One morning a family of ibexes (mountain goats) climbed up from the valley to listen. One after another, I counted sixteen. People say that classical music has a shrinking audience. Maybe we should turn then to the animals... Perhaps we should "invite" nature. We might find some answers. Schubert certainly thinks so. He just rented a little trolley calling everybody "all aboard", before disappearing in the distant creek. If classical music is dead, then I guess the desert has no life: I see no water, yet there are so many different kinds of plants all around, up and down the rugged hills. I see no food, yet so many insects in all shapes and form find enough to live together in perfect harmony – scorpions, butterflies, spiders, beetles and many other kinds of small creatures whose names I probably will never know. The desert is full of life, and our classical music finds it to be a natural spring, full of pure energy. Are we ready to take some risks – Brahms says "yes", as do Prokofiev and Rachmaninov, and of course Liszt. They dominate the "Concerto competition". Bach and Mozart preferred to stay out of this. Bach was last seen running after one of his fifteen children. They are absolutely thrilled playing with the ibexes. Mozart on the other hand was working on a new opera – "The Magic Canyon". The competition begins. Risks are taken. Mistakes are made. These are all essential in the learning process. Out of fifteen contestants, six are selected to play in next day's finals. Three are chosen to play in a couple of months with the orchestra. By now, two weeks have gone by. Only five days are left and it seems to me that most students are going through a period of transformation – they spend most of their time outside, rather than inside, some even decide to sleep out in the desert. Is it the music, the way we teach here, or is it the place? I truly believe that the answers to the questions we encounter, when we learn a new piece, do not lie all inside the practice room. They are also found outside – in a place, in a conversation, a hike, a visit, and sometimes also in just marveling the surroundings of a place like Sde Boker. There are only a couple of more days. Schumann hasn't yet sent out all the invitations for his new "Desert Carnaval". I heard he has some new characters in it that we have never heard of. He must hurry up if he wants Mendelssohn to join the party. The latter thinks he found a new symphony hidden in one of the caves here. Will he resurrect another composer yet again?! Tchaikovsky in the meanwhile has to quit worrying about hearing his Nutcracker piano arrangement played here. Who said one cannot Dance in the Desert? A total of 72 students and 14 teachers performed about 150 pieces in the concerts, worked on 27 other pieces in the public master classes, and explored countless of other works in the private lessons. We head to a Bedouin tent for our farewell dinner before waking up from the dream and going back to reality. Two and a half weeks of intense back and forth between young musicians and senior ones, all nourished by this magical environment changed us, made us more aware, enriched, rounded, rugged, inspired and perhaps even... better pianists.